Fluid couplings are indispensable in providing connections in systems that involve the flow of air, water, oil, or gas. Nitto Kohki couplings are distinguished by their high quality and durability. Their safe, easy one-hand connection and disconnection enables superior operability. Their built in automatic open and shut valve provides high flow, easy flow control and realizes a perfect seal. To meet diverse needs for couplings for applications in the home as well as in the medical, biotechnology, nuclear, semiconductor and computer fields, Nitto Kohki offers a full product line-up comprising of 3,000 series and some 25,000 individual models. 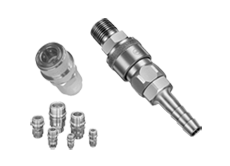 Nitto Kohki couplers provide quick and easy connection/disconnection of fluid lines such as water, oil, gas, and air. They completely eliminate the inconvenience of connecting/disconnecting conventional thread type couplings or flanges, fluid leakage, and hose kinking, while providing quick, convenient control and maintenance of fluid line connections.